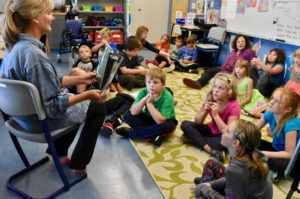 This October, second and third graders at Vinalhaven School participated in Leaps of Imagination. 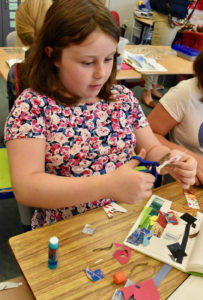 This years programs was “Galvanizing Connections Between the Island Landscape & Art,” and led students on a collaborative art making project, interweaving scientific investigation and literacy to cultivate stewardship of the land. LEAPS is also about encouraging students to practice their imagination, to push past their comfort-zone to think in new ways, greet new ideas and explore. 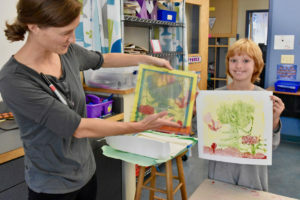 Mentor artists inspired students to connect with nature to create their work. Students were instructed to think about their ‘home place’. “If kids gain a deep understanding of and appreciation for their Home Place, they are more likely to become responsive caretakers of the land around them. Art gives them a chance to represent what they’ve experienced and recall what they’ve felt in the forest. One child told us that she felt a sense of “calm.”” LEAPS director Nancy Frolich wrote on her blog, https://leapsofimagination.wordpress.com. Walks through the woods inspired observational drawings. Students kept journals to record ideas, thoughts and to create. The journals and observations served as a launch pad for printmaking. Students made two different kinds of stamps that served as the centerpiece for their final project. 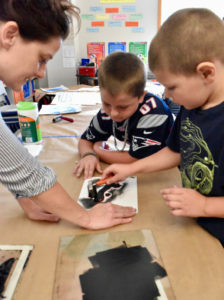 LEAPS encouraged students to further investigate their artistic practice, through a variety of mediums and collaboration. 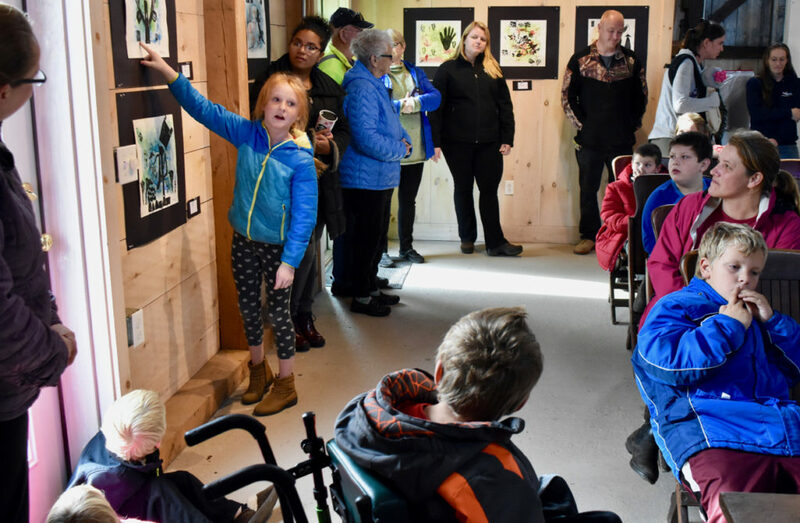 Students presented their final work at Windy Way Barn on Vinalhaven. They talked to the audience about the importance of their work, how and why it came to be. Parents, families and friends were treated to experience the culmination of the three-week program. This program was a generous collaboration with the Vinalhaven School, PIE, Vinalhaven Land Trust and LEAPS of Imagination. Thank you to Elaine Crossman for hosting the exhibition at Windy Way. Thank you to LEAPS teachers Nancy Frolich, Sandy Weisman, Alexis Iammarino, Sarah Rogers and Avis Turner for bringing your expertise to Vinalhaven. To read more about LEAPS, https://leapsofimagination.wordpress.com.